Although it's increasingly difficult for cable companies to deny the so-called "cord cutting" phenomenon, media conglomerates still have a stranglehold on many subscribers. It's easier than ever to catch your favorite TV show or movie through legitimate online avenues, but it's still tough for some folks to completely abandon their cable provider because Web services are seriously lacking in certain areas like live sports and local news coverage. 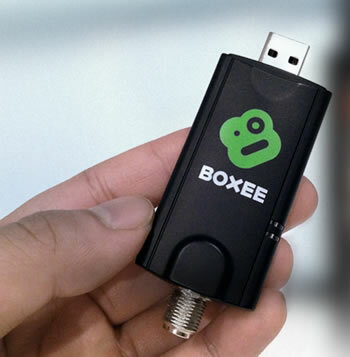 Boxee hopes to ease the transition away from conventional television with its new "Live TV" dongle. The device will allow owners of the Boxee Box HTPC to access channels such as ABC, CBS, Fox and NBC in HD with no monthly fee. The Live TV kit comes with an HD Antenna that connects to a coaxial to USB adapter. Once attached to your Boxee Box, you'll be able to select Live TV from the main menu to watch live television completely free of charge. The Boxee Live TV dongle utilizes the free over-the-air HDTV broadcasts that launched in 2009. Naturally, you can access this content without Boxee's products, but this is an easy way for Boxee Box owners to take the final step away from pay TV. It's worth noting that if you're in a remote area without access to ATSC broadcasts, the Live TV kit also supports unencrypted cable connections (ClearQAM). In other words, you can pay for basic cable through your conventional TV provider and feed that through the Live TV dongle for a similar effect. "Last year, 89 of the top 100 shows were on broadcast networks -- they remain the most popular channels on cable. The Superbowl, the World Series, the Oscars, the Grammys, presidential debates and addresses, the Olympics… they’re all on broadcast," writes Boxee CEO Avner Ronen. "Yes, there are hundreds of cable channels, but make a list of the stuff you actually watch. You will probably find that most are on broadcast and the rest are available on Vudu/Netflix/Network sites. What is left on your list? Is it really worth $85 a month?" The Live TV tuner and antenna are available for preorder with pricing set at $49. The package is expected to ship sometime in January 2012. The Boxee Box itself is currently available for around $178 on Amazon -- over $50 less than its launch price. The platform was criticized early on for its lack of support for popular services such as Netflix and Vudu, but both have since been added. It still lacks access to Amazon's streaming services. As a side note, if you don't already own a settop box, you may want to wait to see what surfaces at CES.